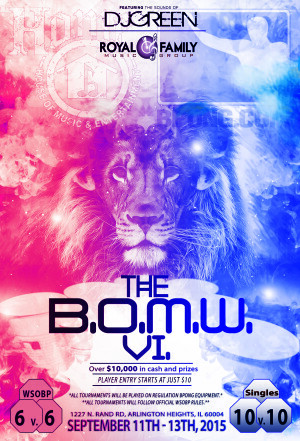 Just over a week ago (September 11th through the 13th), Chicago House of Music & Entertainment played host to The Best of the Midwest VI (BOMW); an event featuring four beer pong tournaments and had projected to pay out over $10,000 in cash and prizes. The hype was real and the 6v6 event started with a bang two weeks before anyone had even stepped foot inside the HOME Theater just outside of Chicago, Illinois. Teams were picked via a live player draft. 22 Captains were assigned, primarily being players from the top 4 placing teams at BOMW V. Those 22 Captains were designated a draft position determined by each player’s registration time. The first 11 Captains to register selected a Co-Captain from the last 11 Captains to register. 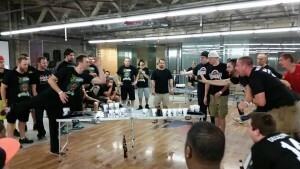 Then, each pair of Captains selected the rest of their 6 man rosters from a pool of draft eligible beer pong players. The first Captain selected was Mike Welsh by his New Jersey Nightmare teammate, Tim Williams. Ray Rivera of the Wisconsin Clown Coalition and Scott Frew of Illinois Insanity were the first Captains to select from the players pool. The number 1 overall pick came out of Michigan via Brandon Juracek. Juracek was a new roster addition this year to last year’s BOMW V 2nd place Michigan Mayhem squad. The 6v6 tournament featured a primary bracket and a consolation bracket that teams who were eliminated from the primary bracket were given an option to buy back into. Captains Andy DeCaluwe of Illinois Insanity and Kyle Eller of the Wisconsin Clown Coalition dropped their first match-up against the Nightmare lead squad; however, they were able to fight their way back to the final series of the primary bracket to avenge their earlier loss by picking up back-to-back wins and securing their spot in the 6v6 Championship Series. Captains Brent Saale of STL’s Finest and Donnie Jones of Michigan Mayhem fell just short in the primary bracket. They took both of their losses to the DeCaluwe/Eller squad. The consolation bracket told a different story for the Saale/Jones duo squad as they blistered through the bracket and set themselves up to once again square off with the DeCaluwe/Eller lead team. DeCaluwe/Eller proved to be too much for the Saale/Jones squad, as they wrapped up the largest portion of a prize pool exceeding $3,000 with the Championship Series win. The Singles Tournament kicked-off day two and the thunder started early with a couple of huge match ups dictating the pace of each bracket. The previously mentioned Scott Frew of Illinois Insanity and Brent Saale of STL found themselves face-to-face (-to-face) in the very first round of the tournament; those two players perhaps being amongst favorites to win the singles crown going into the event. Spoiler Alert – It was Frew. Frew won everything from game 1 on and not through any fluff. Scott won games against Kurt Heizmann, Nick Trupiano, and Donnie Jones, all players on the top two squads from BOMW V. He also beat the 1st round 9th overall pick from the 6v6 draft tournament, Paul Dausman, of the Indiana Dream Team and the 1st overall pick selected (including Captains), Mike Welsh, of the New Jersey Nightmare. Frew eventually found himself in the king seed, front and center on stage at the HOME theater, with 10 crisp new blue bennies staring back at him from the center of the table; standing between him and those Franks, his opponent, Eric Lewis of Michigan Mayhem. Eric perhaps is one of the best players in the country that is still relatively unknown. He utilizes his length with a shot only players possessing incredible balance could perform well with. Mean lean or not, Scott Frew was still too much as he took home the Best of the Midwest VI Singles Championship. As 7pm rolled around, the buzz came to a head as the preliminary rounds of the 10v10 Best of the Midwest Main Event started. Going into play the favorites were the defending champions and their counterparts in last year BOMW V Finals at The Willis (Sears) Tower, Illinois Insanity and Michigan Mayhem. Although neither team proved to be dominant in preliminary play, Michigan Mayhem settled comfortably into the 2nd seed being edged out of the top seed by a young New Jersey Nightmare squad. Another young team, a fresh STL’s Finest line-up showed up to play, rounding out the top 3. Michigan LOL edged out Insanity by a single cup for the 4th slot, dropping Illinois to a mediocre 5th seed. The stage was set for the ultimate finals and it was waiting for 2 teams to seize the opportunity to play under the lights. The two teams surviving the playoff bracket would square off and play 1 game at a time in a best 6 of 11 series on center stage inside the HOME Theater! After getting passed Michigan LOL, the reigning champs (Illinois Insanity) lined up against the New Jersey Nightmare and took their first series loss of the playoff bracket. STL stepped up big and threw a right hand at the other giant to drop Michigan Mayhem. The aforementioned upset of a sleeper Wisconsin team didn’t go quietly as they eliminated both Illinois Insanity and Michigan Mayhem before getting stopped by New Jersey Nightmare, pending a Best of the Midwest VI Main Event Championship Series against STL’s Finest. St. Louis came out swinging looking for an early knockout in the best 6 of 11 series as they jumped out to a huge 5-1 series lead. The Finals seemed to be all but wrapped up as that’s nearly as insurmountable as a lead one can get, however, New Jersey picked themselves up off the floor and kept fighting. Little by little New Jersey chipped away until they eventually pulled themselves even and forced an 11th and decisive game. Although nearly the entire crowd seemed to be behind the St. Louis team, (as I’d assume the majority of the Midwest players would prefer the Gilkison Cup to reside within the Midwest), New Jersey eventually prevailed and pulled off the near impossible by coming all the way back from a 5-1 deficit to claim The Best of the Midwest VI Championship! 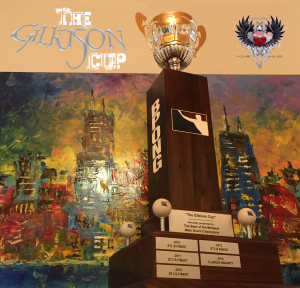 After being presented with The Gilkison Cup, the New Jersey Nightmare team decided to donate their individual Cup tours in order to house the cup in the home of the Gilkison family, after their plate is added, until The Best of the Midwest VII. The WSOBP XI Satellite Tournament finals saw a match-up between the titan combo of Johnny Fourdyce and Eric Lewis vs. 6v6 Champion Kyle Eller and Michigan LOL shooter Tyler Spencer. Tyler set out to broaden his name and found an opportunity to bring down two of the best in the building in the finals of what’s undoubtedly the toughest Satellite of the year within in the Midwest. He fell just short but garnished respect, as Fourdyce and Lewis picked up the bid wins to conclude all tournaments at the Best of the Midwest VI. A special thanks to WGN 9 for stopping by to shoot with us on Friday (9/11/15) and FOX 32 for dropping by Sunday (9/13/15) for Bears Postgame Live from HOME Bar Chicago! A special thanks to DJ Joe Green for once again holding down the Best of the Midwest for 3 straight days, as well as, a special thanks to Tommie King for doing a set for us on Friday night! A very special thank you to all the organizers and players who came out to this tournament. You all host and play in tournaments, year around. Without you, every organizer and every player, this tournament can’t happen. You all are what make this event so great! The clock is ticking quicker as September 11th approaches and the most anticipated tournament in the Midwest kicks-off at The Chicago House of Music & Entertainment on Friday night! Friday night’s tournament will showcase a change from the typical Best of the Midwest lineup. A 6v6 formatted tournament will replace the familiar Friday night (2v2) $2.5K tournament. A variation in how squads are generally formed for larger teams will put a bit of a twist into game play. While the 10v10 Main Event features restrictions limiting player team designation based on geographic affiliations, the 6v6 draft tournament aims to develop player relationships outside of a player’s primary location. By having numerous players from various states on one team it allows players to build potential partner relationships with players outside of their area by familiarizing themselves with one another; not only on a personal level but by also experiencing game play on a high level together. The draft leads players who are arguably the best players at this event to become students of the game. If they want to win the tournament, they’ll need to draft the best team possible. In order to do that, they’ll need to be familiar with every player’s game in the draft pool. 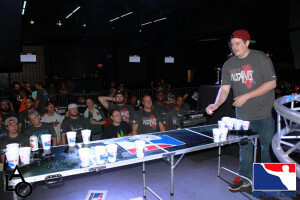 Friday night’s entertainment will also feature live sounds from Las Vegas DJ Joe Green, who is also The Official World Series of Beer Pong DJ. Tommie King, of RFMG ENT., will also be featured live later in the evening. Saturday’s festivities will start at 1:00pm with a singles tournament. It’s you vs. the world and it’s only ten bucks to play! Want to play just to have some fun and not destroy your wallet? This might be the tournament you’re looking for. After the singles tournament wraps up, the show we all have been waiting for will begin. Roughly around 7:00pm, The Best of the Midwest (10v10) Main Event will commence. Saturday’s preliminary play will determine each team’s fate within the following day’s double-elimination playoff bracket. Sunday, September 13th, will be the day a new or reigning champion will be crowned as the victors of The Best of the Midwest VI. The (10v10) Main Event playoff bracket will begin at 1:00pm. Players and teams from across the country will battle it out on 5 tables at a time with 5 (2v2) games taking place simultaneously on those tables, advancing the squad who takes at least 3 out of those 5 games. 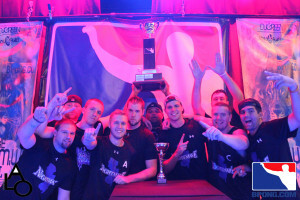 The defending champion Illinois Insanity squad, deep in experience, will bring back almost every player from last year’s championship team. The Insanity will try to get half way to STLs Finest record 4-straight Best of the Midwest championships, with their second straight title. 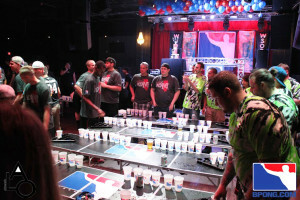 Players hailing from Michigan will be coming in strong numbers, (thanks to our associate organizations BPA and MAC Pong), as they will enter at least 3-teams into this year’s main event. 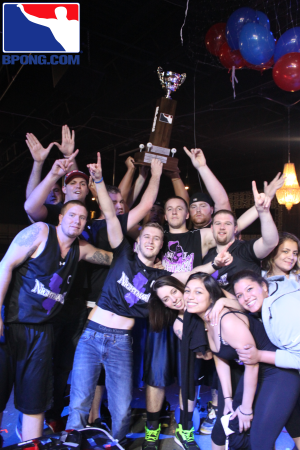 One such team, Michigan Mayhem, who will return the majority of their team from last year’s 2nd place roster, is determined to better their runner-up efforts from last year’s BOMW V Main Event. The symbolism the cup holds ensures the legacy of the late, great beer pong player, Zach Gilkison, is carried on. The perpetual plates will etch each year’s champion into BOMW history and the cup itself will forever represent a piece of what Zach really meant to the beer pong community. 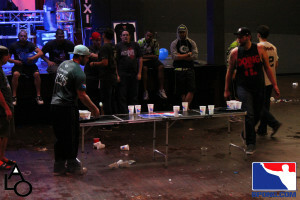 After the fire settles and a Main Event champion is crowned, the attention shifts to The World Series of Beer Pong XI (WSOBP XI), as BOMW VI will conclude with a World Series of Beer Pong XI Satellite Tournament. This event will qualify two friends to participate in The WSOBP XI at the Westgate Las Vegas Resort & Casino from July 6th – 10th, 2016. Their entry into the WSOBP XI tournament will also include a 4-night stay at the host venue! While registration is closed for BOMW VI’s Main Event, 6v6 and Singles tournaments, you can still register to participate in The WSOBP XI Satellite Tournament until September 11th! Can’t make it to The Best of the Midwest this year and want to keep up to speed on how things are shaping up? Add us on Snapchat: “OfficialBPONG” and catch all the action live! 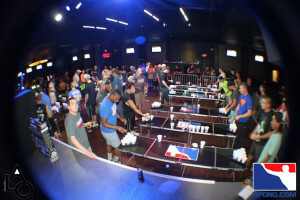 For more information on The World Series of Beer Pong XI, head over to BPONG.COM. Not finding what you are looking for? Drop us a line at [email protected]!